A few months ago a young lowercase L reader submitted this photo of an AllSTATE Painting van, not to be confused with Allstate auto insurance, who spell their company name with only one capital letter and the remaining lowercase. Now reader Elisabeth stirs the lowercase L bucket with this photo, a marquee welcoming AllSTATE INS. I think the person who assembled this sign should call AllSTATE Painting to fill in the missing uppercase L's. 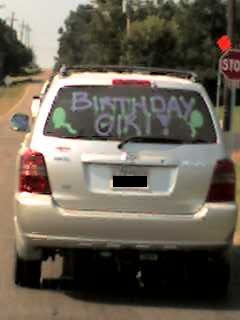 Lowercase L reader Dave found this rear window message to a lucky Birthday GIRl in Jonesboro, Arkansas. This one is certainly not a case of trying to save space ... just look at that extra-wide exclamation mark!!! 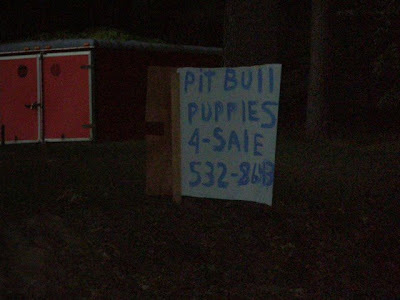 Ryan sent in a link to his Picasa Web Album with several photos featuring PIT BUll PUPPIES 4 SAlE, as well as a Tractor For SAlE (the tractor sign isn't so bad because the lowercase L is taller than the other letters in the word, so it isn't confusing). With the Pit Bull Puppies, the word BUll isn't so bad, either. It's the SAlE that throws things off. It even makes me glance back at PUPPIES, wondering if they're actually pupples? And I don't want to buy any pit bull pupples, I've heard they're dangerous. In the wake of the latest Harry Potter book release, lowercase L reader Lindsey submits this fine work of wizardry. I was at a midnight Harry Potter party at a Kroger grocery store in Texas, and I HAD to take a picture of the sign. Looks like it took them two tries to get "JUlY" wrong. But, the people in charge of selling the books weren't too bright to begin with - they were planning on having a raffle drawing at 1 am, because they figured people would want to stick around and have the party AFTER they had already bought the book. Yeah. Not much thought went into that one. What rational explanation could there be for having a lowercase and uppercase L in the same word? It couldn't have been a space issue - there's room for the capital L in the middle. Was the person in a hurry? Or just CIUELESS? Yes, it looks like the copy editor was in a hurry. But he probably didn't forget to capitalize this first L in AVAlABLE. 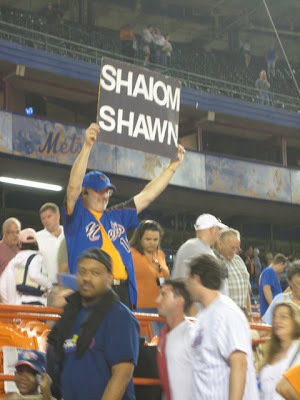 Rather, it looks like he left the entire L out of AVAILABLE. A visually stunning example, nonetheless! 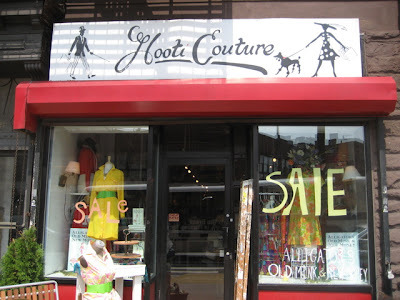 This is one of the most amusing examples lowercase L signage submitted I've seen in a while! 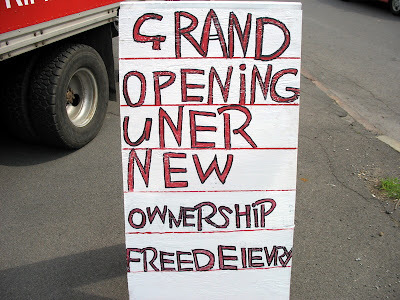 Found in front of a chinese restaurant in the ghetto of Syracuse, New York, by Eric K, it looks like the author misjudged both horizontal and vertical writing space. 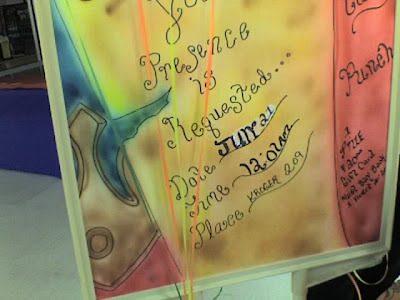 As he got closer to the bottom of the sign, looks like he panicked with "UNER", switch to a smaller size text with OWNERSHIP, and finally crammed FREE and DElEVRY together using every space-saving technique he could think of. Yet another creative spelling of DELIVERY. It must be a South Jersey thing. 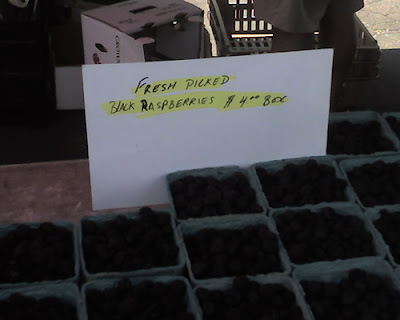 Visiting my family this past weekend in my hometown of Vineland, New Jersey, we went to the Red, White & Blueberry Festival in Hammonton, NJ, "Blueberry Capital of the World", on this warm first of July Sunday. Keeping my eyes peeled for a rogue BlUEBERRY sign, I shouldn't have been surprised to find this YARD SAlE sign before we even reached the festival grounds. It took me back to my youth, when I started noticing these lowercase SAlE L's in my rural surroundings. It also reminded me of why I left South New Jersey, fleeing up north to New York, where I thought I'd never come across another lowercase L again. 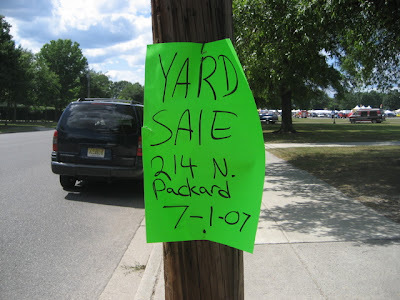 Interestingly, there were plenty of these green YARD SAlE signs leading up to the Blueberry Festival, some written as SAlE, others as SALE. Must have been two authors constructing the signs. Perhaps brothers ... one good, the other wicked.